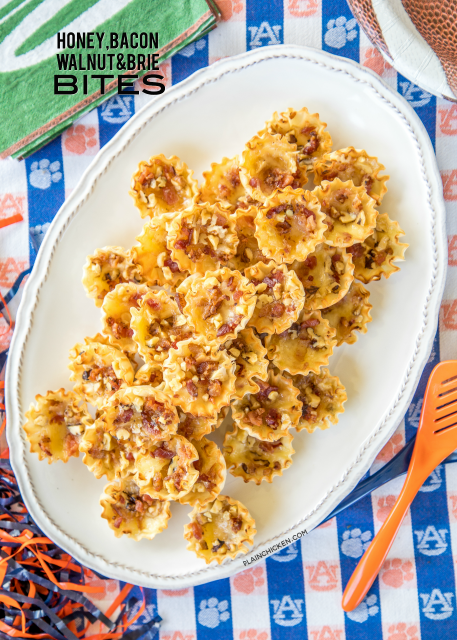 Honey Bacon Walnut and Brie Bites recipe - sweet and salty goodness!!! The flavor combination is totally addicting. Can make the bites ahead of time and refrigerate until ready to bake. Great for all your holiday parties and tailgating!! You might want to double the recipe - these cheese bites don't last long!! Baked brie is one of my favorite party appetizers. 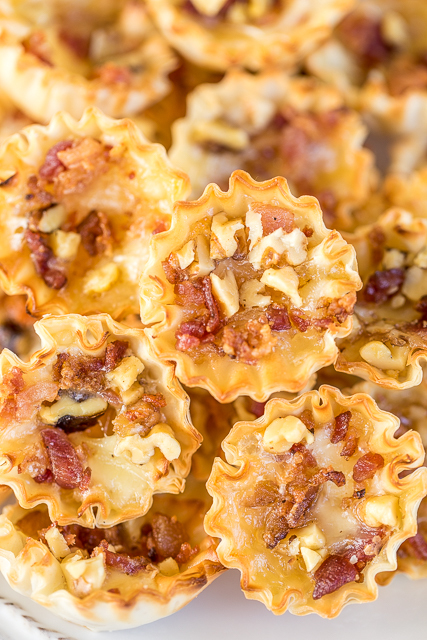 These Honey Bacon Walnut and Brie Bites are my absolute favorite way to eat brie! I mean, cheese, bacon, nuts and honey. YUM! The sweet and salty combination is hard to beat!! This recipe was inspired by my trip to Amsterdam. We ate in a cute sandwich shop one day and this was one of the sandwiches that we ordered. I just couldn't get enough of the flavor combination! It is totally addicting. 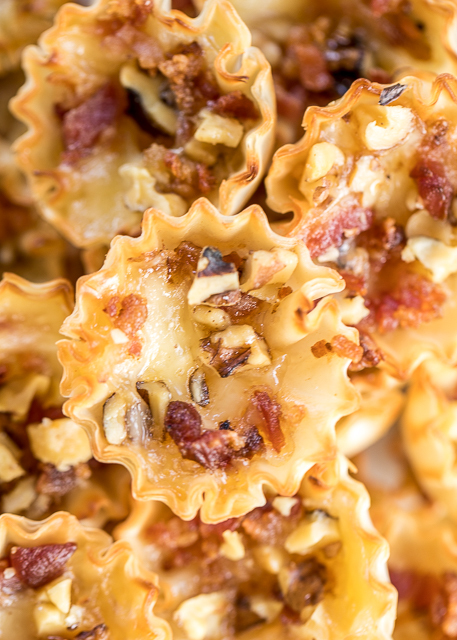 You can assemble these Honey Bacon Walnut and Brie Bites and refrigerate them until you are ready to serve them. They taste great hot out of the oven or cooled to room temperature. They are great for tailgating this weekend and all your upcoming holiday parties! I have a batch in the refrigerator right now! Can't wait to bake them up tomorrow for watching all the games! Preheat oven to 350ºF. Place phyllo tarts on a baking sheet. Cut brie into 30 pieces. Place one piece of brie in each phyllo tart. Top each piece of cheese with some walnuts, honey and bacon. Bake 10 to 15 minutes, until cheese is melted.